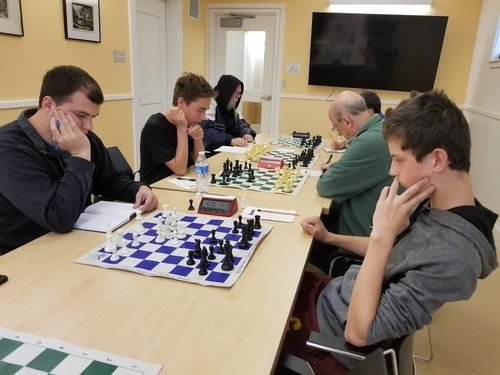 10.24.18 Twenty-four players competed in five sections at the Cape Elizabeth National Chess Day Tournament played at Thomas Memorial Library in Cape Elizabeth on Saturday, October 13, 2018. 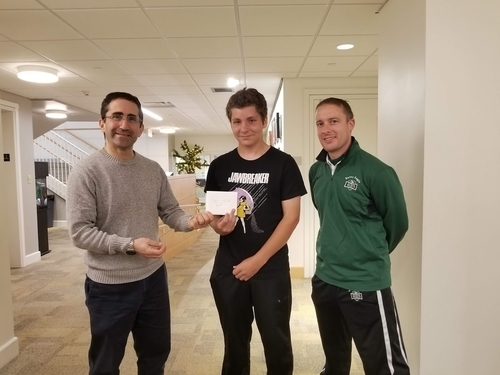 Winners were: Matthew Fishbein (Swiss 1), Oisin O'Searcoid (Swiss 2), Greg Hansel (Quad 1), Marco Hansel (Quad 2), and Zachary Brislin (Quad 3). Here's the illustrated tournament report with US Chess crosstables. 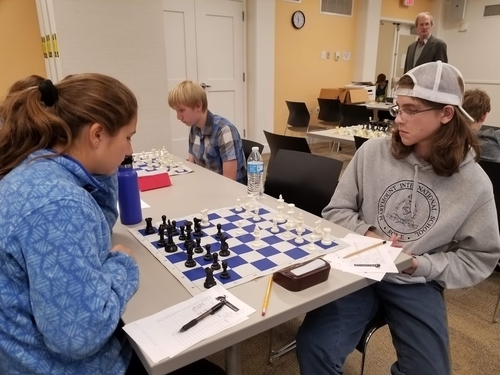 Clara Parker (left) and Analise Gordon celebrate National Chess Day 2018 at the Thomas Memorial Library in Cape Elizabeth, Maine. Thanks to Phil Lowell and Eric Dinnerstein for contributing to this report. 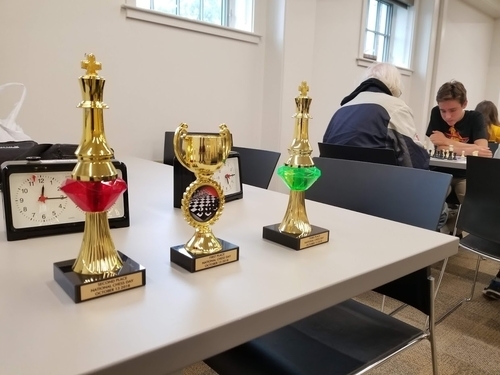 Thanks to the hard work and determination of Eric Dinnerstein, the Cape Elizabeth Chess Club, and tournament director Phillip Lowell, another successful National Chess Day Tournament was held in the beautiful seaside town of Cape Elizabeth, Maine. 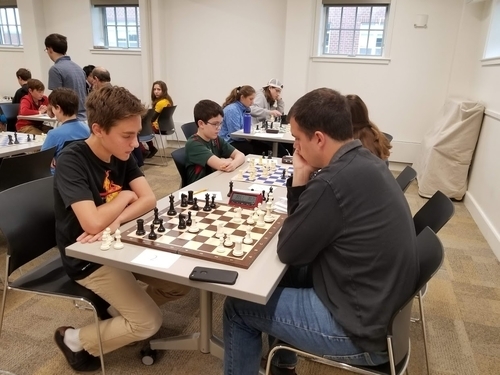 In the top section--Swiss 1--Matthew Fishbein scored a perfect three for three to keep his US Chess rating at a whopping 2291! Congratulations Matthew! 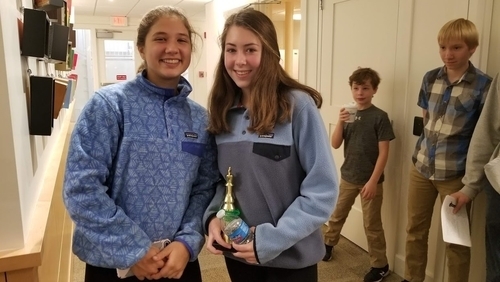 Fishbein was trailed by Stephen Morse and Isaac Dinnerstein who tied for second with 2.0 points. Frank Di Renzo and Tyler Rodenberger put up a point each and Dan Fishbein (aka Matthew's Dad) went scoreless on the day. 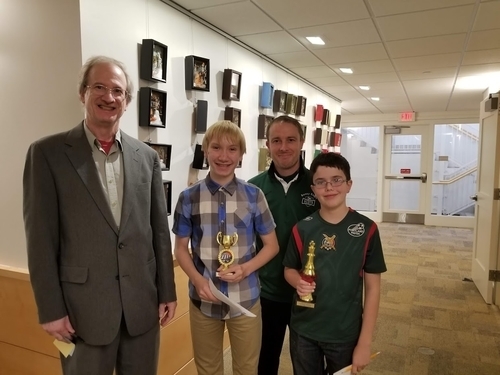 Bonny Eagle chess coach Oisin O'Searcoid blanked his opponents to win Swiss 2 with 3.0 points. Ambrose McCullough and Maximilian Matthews tied for second with 2.0 points apiece. Gregory Hansel swept Quad 1 with a perfect 3.0, and Marcos Hansel and Zachary Brislin did the same in Quads 2 and 3 respectively. We thanks all those who participated in this event: players, organizers, volunteers, parents, and drivers! 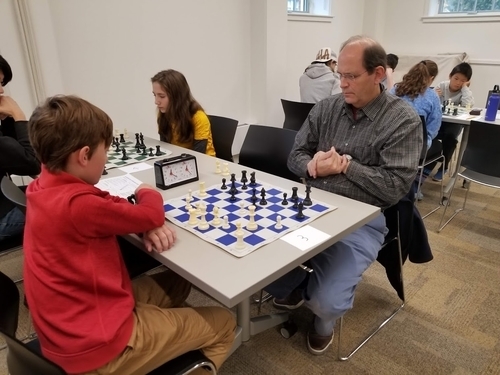 Thank you for supporting National Chess Day and chess in Maine! 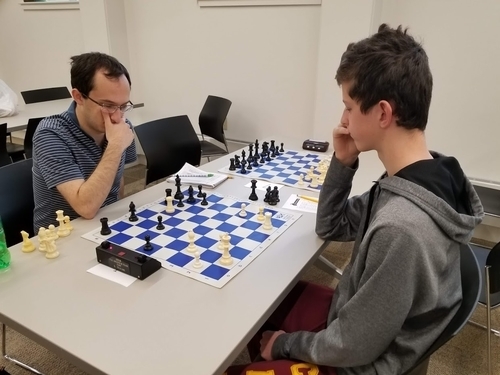 Swiss 1 section winner Matthew Fishbein (left) plays Tyler Rodenberger in round one. Fishbein receives congratulations and a prize from tournament director (and former coach) Phil Lowell. Clara Parker (left) plays Quad 2 winner Marco Hansel. 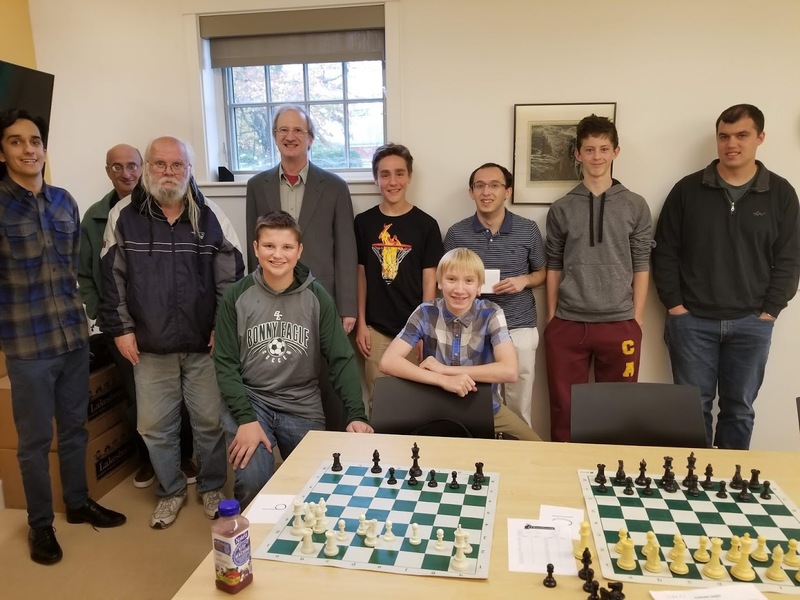 Some of the Cape Elizabeth National Chess Day 2018 competitors with tournament director Phill Lowell. 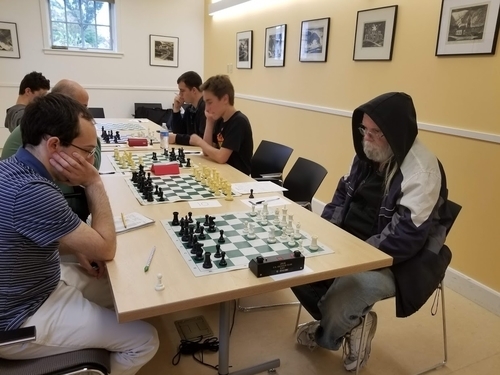 A hooded Frank Di Renzo faces off against Matthew Fishbein. Quad 1 winner Gregory Hansel (right) takes on Ander Erickson in an experience vs youth match. 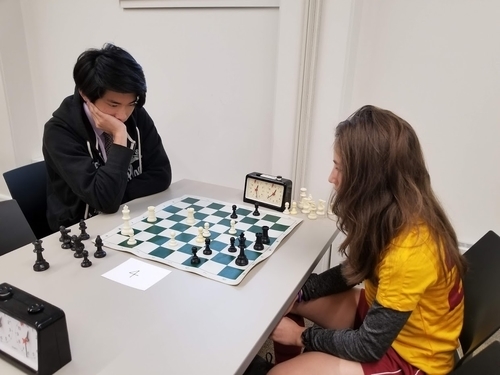 Zoe Dinnerstein (right) plays Danny He in Quad 1. Some of the bling that was up for grabs. Isaac Dinnerstein (left) plays Stephen Morse in Swiss 1. Tournament organizer Eric Dinnerstein hands out prizes and congratulations to Max Matthews and Oisin O'Searcoid. Thanks again to all who made this tournament a great success!